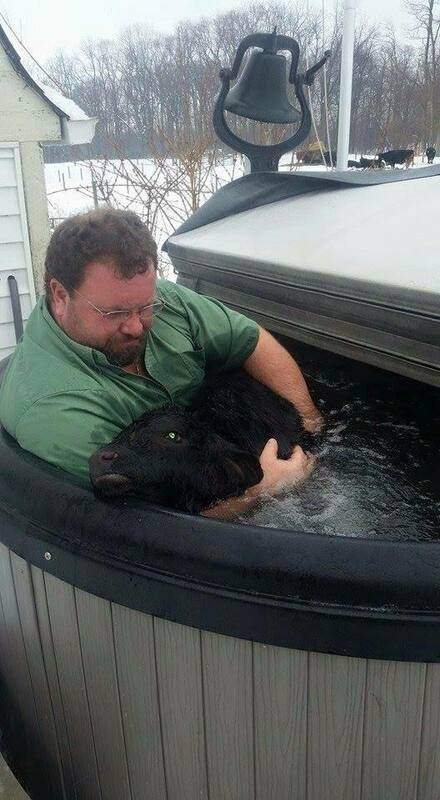 This farmer had a calf born in a snow storm and had to raise its body temperature. This comment was posted to reddit on Jan 28, 2016 at 10:41 pm and was deleted within 17 hour(s) and 28 minutes. For a lot of small farmers, food animals are like pets. When you adopt a domesticated pet animal (a dog, a ferret, or a guinea pig; purposely excluding cats), you plan to let it live out its lifespan in your captivity and then euthanize it. You do this because of something you get out of it - love, companionship, purpose, protection, family. These animals in turn need us, they were bred to be domestic animals and they're incapable of sustaining long-term populations in the wild. It's the same with domesticated meat animals. Cattle, sheep, domestic goats, and common pigs are all incapable of sustaining themselves in the wild. Sometimes they can survive feral for a time or crossbreed with their wild counterparts but they're species that are incapable of surviving without us. At ethical farms, they're well cared for and often loved for what often amounts to a respectable old age for their species. The large farming conglomerates are a different story of course. Personally I stopped eating all commercially-produced pork after seeing hidden camera footage of commercial pig farms, but each person has to make their own decision. Bottom line: everyone needs to make their own choices. Everyone should at least find out where their food comes from and then decide for themselves what to support. If nothing else, avoid meats from the major companies and buy find an ethical butcher locally. I'm not a big proponent of the way "organic" food has been misused, but when it comes to meat that can be an indicator. Here's a decent list I found online as a starting point. While googling around (as I type this comment) I've decided to change my buying habits a bit as well.